Balti Dinner Set | Buy Online at The Asian Cookshop. 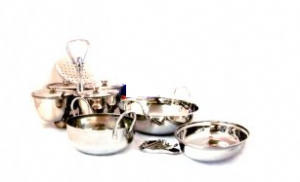 Balti Dinner Set is made up of popular sized heavy grade stainless steel dishes for curry, rice and chutney serving. Serve Indian Food the Restaurant way! 1 x Solid Chutney and Pickle Tray.